A BNP leader and a Jubo Dal leader were hacked in separate incidents in Cumilla and Chuadanga districts on Saturday. In Cumilla, Meghna upazila BNP President Ramiz Uddin Londoni was attacked allegedly by Jubo League men at Lakkhankhola village of the upazila in the afternoon. District BNP Assistant Organising Secretary Sahabuddin claimed that Jubo League men, led by former upazila unit convener Mujib, hacked Ramiz while he was going to the upazila BNP office. 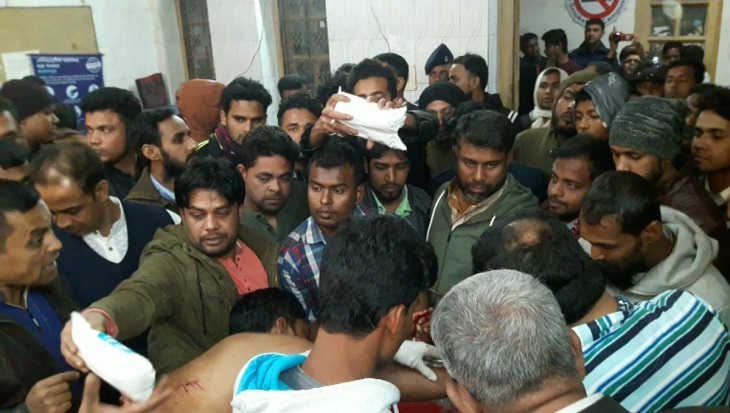 Officer-in-charge of Meghna Police Station Abdul Majid said Ramiz was attacked at one stage of an alternation between Awami League and BNP supporters. In Chuadanga, unknown miscreants swooped on district Jubo Dal President Sharif Ur Zaman at Baganpara of the district town around 8:30pm while he was taking tea at a teashop. The attackers chopped him with sharp weapons, leaving him injured. Locals rescued him and took him to Chuadanga Sadar Hospital.